So I finished part of my beach project. I finished the beach pillow. I used a vinyl table cloth and cut it into the size of pillow I wanted. I then serged around the edges and stuffed the pillow. 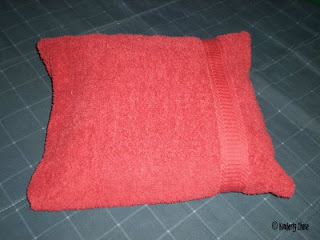 Then I made a cover for the pillow out of a towel. Here's the finished project! Now I just need to finish the blanket.